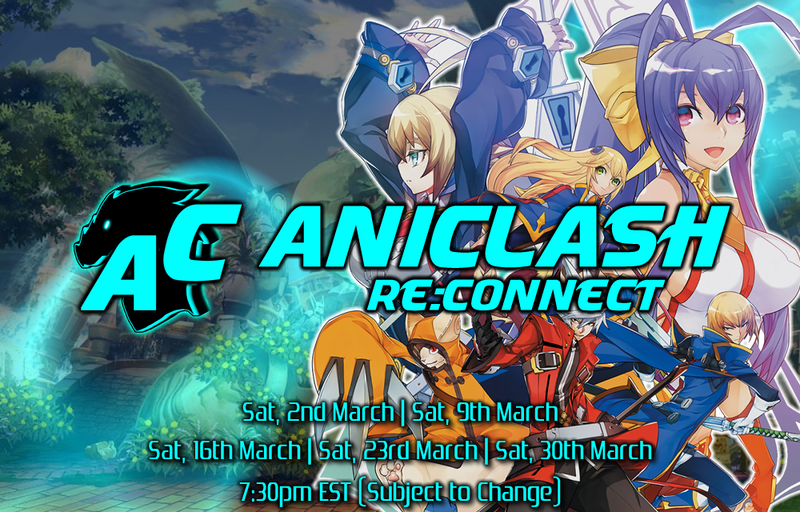 Aniclash is back online and ready to provide you with plenty of delicious Blazblue Action in this Comeback Tournament Series: Aniclash Re:Connect throughout the month of March! Tournament Winners will receive $20 as a prize. If you preemptively quit out of the match (with out taking the loss normally) you will be subject to a month long ban from AniClash Tournaments. As such, please keep this in mind as this is a new rule. Stream located at our Twitch Channel; make sure you subscribe to that channel, our New Youtube Channel, Twitter, and our Discord to stay up to date with all things AniClash! Double Elimination. Best of 3 for bracket matches. Winner's/Loser's/Grands are Best of 5. Bracket is not final until after tournament start time. Any questions, ping @Euchre#4335 on the Aniclash Discord.